When I was visiting my mom in California, I was able to spend time with a friend. While we were at lunch we were talking about something (I can't remember what right now), but what came up was people judging other people. I find that sometimes I can be judgmental. 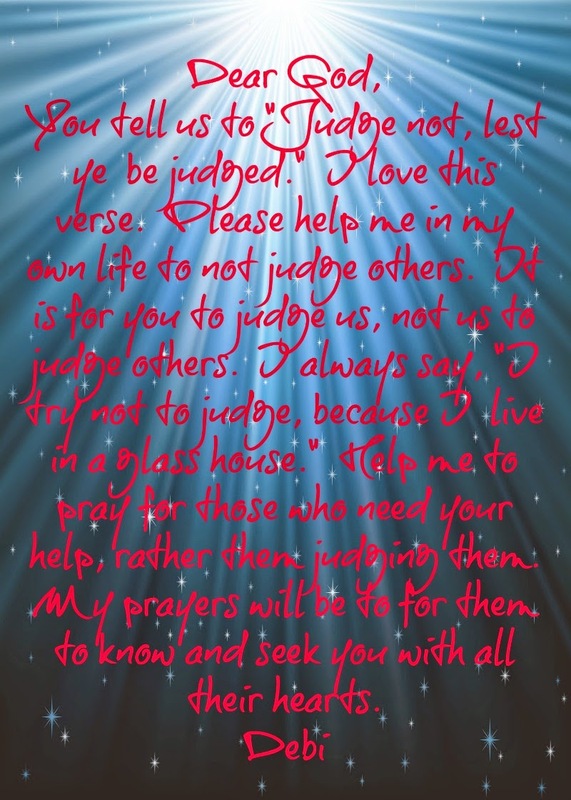 I try very hard not to, and I am learning slowly to pray for a person rather then judging the person. What I would like to happen is to immediately pray for that person to know God with all their heart. She said something that really stuck with me about judging. She said when we judge we are trying, convicting, and then judging a person without all of the facts. The only one who knows the whole story and is entitled to judge, is God. I want to make sure I'm clear with everyone, this is not about a court trial, but what goes on in our everyday lives and in our hearts. I want God to use me to pray for other people when the urge to judge comes up. Help me to pray for them to find God and know God's will for their lives. I want my initial response to be prayer, not judgement. I have shared a few verses below that I hope you'll like.